Suzi does the 5x50 Challenge! From 30 March until 19 May I'm going to be taking part in the 5x50 challenge! The easy part: it's only 5k. The hard part: I need to do it every day...For 50 days. A very belated post! But I'm done!! 309km....51 days..... And I have raised £1,650!!! I am ecstatic! Thank you so, so much to everyone who has sponsored me! But the biggest goal by far was to raise funds for Thyroid UK! Yes, not drinking/eating sugar/fitting in exercise was a complete pain - but it was definitely well worth it. I raised so much more money than I could have hoped for, and the lovely emails of congratulations that I've received from Thyroid UK have made it all worthwhile. Thyroid diseases affect 1 in 20 people and I know first hand how frustrating it can be. Since having part of my thyroid removed I had noticed massive changes in my body, particularly in my weight and energy levels. However, because my blood tests were showing that I was within the "normal" range, my GP was extremely dismissive of my concerns. In fact a nurse told me that I simply had to "eat less pies and do more exercise". Not particularly helpful given that I was sitting with a print out of my food diary and exercise regime, showing that I hadn't eaten a pie in years and was exercising nearly every day. Her attitude seems to be frighteningly common within the NHS. I certainly got the impression that my GP surgery felt that I was overweight and simply making excuses, rather than putting in the hard work to lose the weight. However, once I got to a specialist (by paying to go private), the treatment has been second to none, but fighting the gatekeepers to get the referral can be a really difficult process. I didn't actually know about Thyroid UK until I was deciding which charity to raise funds for. However, a quick look over their website (and then a more in depth look if you are interested) shows some of the brilliant work that they are doing. Personally, I think that the most important thing that they do is provide information to people in order to help them get the correct diagnosis and treatment. They are also funding research and providing resources where needed. It seems like I'm not the only one who has had problems with an unsympathetic GP (I'm trying to be balanced and failing miserably - at least I've not written "down right useless"!) and having a community of people with experience of the same is really useful and I am sure that I will be drawing on their expertise in the years to come. Everything is going great in my life just now - and I take thyroid pills daily which have made the worth of difference. However, that really wasn't the case a few years ago. I was frustrated and worried by the changes in my health, and my GP was not able (or willing - sorry - I really need to reign it in!) to help. I had started to feel like the problems were all in my head, and it had really started to make me feel down. Luckily my family and friends were extremely supportive and helped me continue to fight my corner with my GP surgery. I was also really fortunate that I was able to afford private treatment. I therefore genuinely hope that some of the money I helped to raise can go towards helping other people like me to get the diagnosis and treatment that they require, and that more research can be carried out to ensure that GP surgery's are able to make efficient and effective diagnosis. And so on that note (/rant!) THANK YOU again to everyone who has sponsored me! This has definitely been the most personal challenge to date and I am so grateful for everyone's support! Day 12 to Day 25! So I'm halfway through the challenge! 142.32 kilometres tracked, with 16 hours 33 mins total!! To keep things interesting I've been on some new running routes, and last week we went to the assault course at Inverleith Park. It was ace. Apart from the monkey bars. And the pull up machine. Luckily this isn't a 5 pull ups a day challenge or I'd fail miserably!! So assessing things half way through, I've decided to add an extra element - partly because I have to make up for missing a day, and partly because I feel like I want to make it more of a challenge. For the next 25 days I'm going to cut out two of my favourite things: alcohol and sugary treats (fruit doesn't count. Costa's Millionaires Shortbread does. Crap!) This is perhaps the biggest challenge of my life. Oh, apart from I'm giving myself one day off on Saturday 10 May, because I'm on a hen! And not drinking would be sacrilege to the Hen Gods. BUT I am going to try to avoid alcohol when I go to the Rugby 7s the weekend before. This is a big ask, as I honestly have no idea what you're meant to do at a 7s tournament if you're not drinking and sitting in the sun. Oh, watch rugby?! Hmm. Avoiding sugar and all good treats is also a ridiculously hard challenge. Because I'm giving myself a day off from the alcohol, there will be no excuses for the sugar. Damn. This might be harder than staying off the booze, because (much to my dismay!) there are hardly ever bottles of booze just lying around the office, asking to be drunk. Whereas there is aaaalways good food. Right now a couple of massive bars of Cadburys and some home baking is whispering my name! But I'm ignoring them!! I am however planning out when I can next have some of Costa's Millionaire Shortbread (it's soooo good!). At the airport. Day 51. With a Gin. It's probably not a winning combination, but if I've managed to avoid alcohol and sugar then it'll be well deserved! I came across a picture on instagram last week which had the 5x50 tag...the caption was 5km down, 245km to go! Eeeeesh that is a lot of kilometres! The 50km down so far have been mainly ok, but sometimes a little challenging. Luckily I've had some amazing running buddies in the form of a bestie and a boyfriend (thanks guys!) 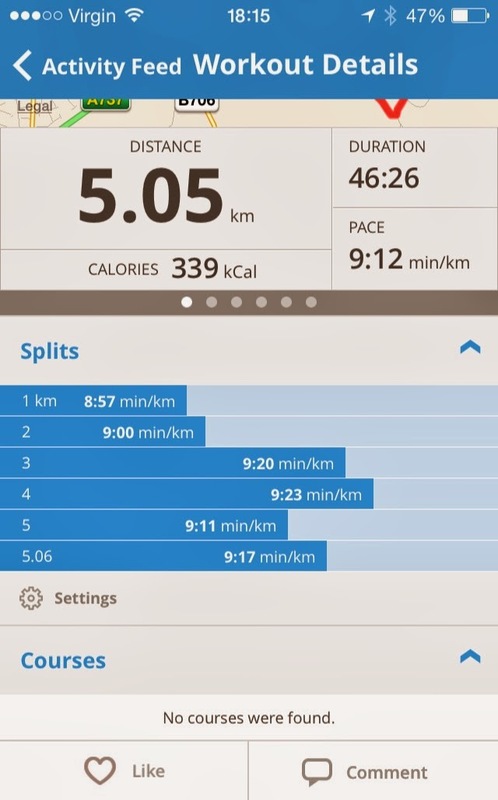 My aim by the end of the challenge is to be able to run a 5km in under 30 minutes, so I'm working to a training and pace plan to get myself there. The first week has been almost plain sailing, apart from some agony in my feet - but with some googling I've found a way to strap them up, and the difference has been amazing! My first run took me 36.42 minutes, and the second run (with the foot pain!) took 38.47....however, by the end of the week, I was down to 34 minutes! Happy days - only 4 minutes to go! So here's to the next 200 kilometres.....! As today is Mother's Day, I roped in my first Challenge Buddy - my mum! A walk might seem like a bit of a cop out for the first day of the challenge - but not when you're trotting behind my mum, who power walks so quickly at times I find myself jogging to keep up! Today is a day to tell mums how brilliant they are - and today has been no different for Oor Aggie! There have been times when I have been scared, worried, fed up or (when trying to deal with my old GP) feeling like I was losing my mind! My mum is always at the end of the phone to reassure me, so starting the challenge with her was perfect! I'm sure that today was probably one of the easiest days of the next 50 - the walks near my parents house are beautiful and it's always good to spend time with mother dearest!! As I'm hoping to run 5 days of 7, it'll be a good few days before I'm next walking my 5 km, so I made sure to take some pictures on the way - the next set will probably be blurrier!! In finishing this post, I've got a very big thank you to say. I received an email on Friday morning to tell me that I'd received my first donation. The donator chose to remain anonymous, but, given that the only person I'd showed the blog and donation page to was my boyfriend, I assumed it was him! However, he assured me it wasn't, and after some head scratching, I realised that the lovely people at Thyroid UK had put a link on their website. It turns out my first donation has come from a complete stranger, and I couldn't be more grateful - so a very big thank you - it is very, very much appreciated! The 5 x 50 Challenge launched in 2012 as a charity challenge encouraging people to run, walk, jog or cycle 5K (or a 30 minute exercise equivalent) every day for 50 days, with the aim of changing exercise habits for a lifetime. 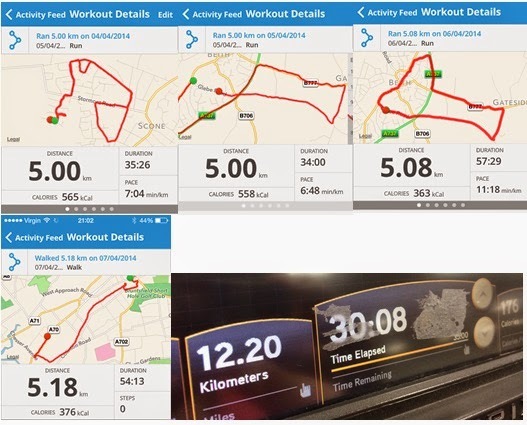 I'm aiming to run 5K five times a week, with a cycle or walk in between to save the old knees! I'll be using blipfoto to take a picture each day and, provided that I've managed to link properly, the photos should show up on the right hand side! The challenge starts on Sunday 30 March and ends on Monday 19 May. Luckily I have a holiday booked for Tuesday 20 May! The first (and most important!) reason is to raise money for Thyroid UK. When I decided to join the challenge, I wasn't really sure who to fundraise for. At that stage, the reasons for taking part in the challenge were to raise money for a good charity, to get fit and to lose some weight. In 2009 I discovered a lump in my throat, which the doctors thought might be cancer. I was really lucky that the lump turned out to be benign, but, because of the position of the lump, I had to have part of my thyroid removed. At first, there weren't really any side-effects, however, I gradually realised that things weren't quite as they had been before the operation. I had a pretty tough time just over a year ago trying to get support from my GP. To say they were unhelpful is an understatement! After months of banging my head against a brick wall, a much fought after referral to a specialist and a change of GPs, I am now on medication, which has made the world of difference. I didn't know about Thyroid UK until recently, but I can see that the work they are doing is amazing, and only wish I'd known about them a few years ago! So it all seemed to tie in perfectly, my half a thyroid is part of the reason why I'm doing the challenge in the first place - and so to raise funds for Thyroid UK seemed like the perfect choice! Running the same route for 50 days could be quite boring! 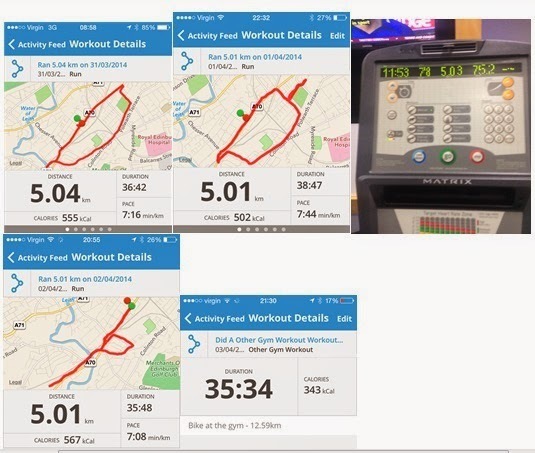 So I'm hoping to find some new running routes around the city, and plan on travelling on some days to make sure that the challenge is as varied as possible! I'll be doing the challenge mainly on my own, but I'll hopefully rope some friends and family along the way. I'll also no doubt need them for encouragement and support! If you would like to sponsor me (pretty please!) simply click on this link to be taken to the fundraising page! For more information about Thyroid UK, click here!